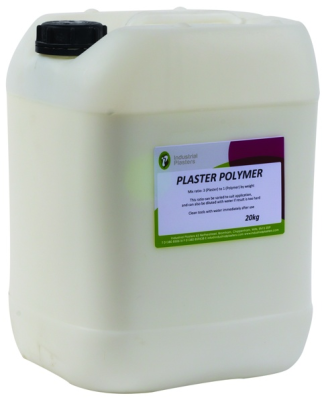 Plaster Polymer - Industrial Plasters Ltd. The addition of Plaster Polymer to plaster adds another dimension into the quality of casts – it makes plaster casts tougher, harder and unlike normal plaster casts it is not as brittle. Adding Plaster Polymer is like adding a liquid plastic into plaster mixes. Whereas plasters tend to be brittle, however hard, the addition of polymer changes all this and opens up a wide range of new applications. We recommend it is only used in Alpha (harder high quality) plasters, like Crystacal R Plaster. It will work with Beta plasters, like Fine Casting, however is not so effective. Depending on the nature of the casting being carried out, we recommend a minimum of 10% addition by weight to the gauging water before adding the plaster powder. Higher concentration should be used for the best results – mechanised mixing is recommended for this. For best results use neat i.e. use polymer instead of water. The addition of this Polymer also means that pigments are dispersed a lot better, and with a higher concentrated mix you can also add proprietary filters, such as stone dusts.